205 strings, soundboard, 88 hammers, 67 dampers, 56 white keys, 32 black keys, various wooden and metal parts. Dismounting pianos to compose prepared pieces, where sound is altered by inserting various metallic or wooden objects onto or in between the strings – such as clamps, screws, rubber and paper – drove me to disassemble a piano entirely, perhaps to see where the experiment in the form, beyond sound, would lead. A bourgeois instrument par excellence according to the Fluxus group, which gained fame by destroying pianos in public as a way to assert its criticism of conformity, the piano has been a target of radical movements since the 60’s. Arsenal is the reconstitution of an instrument using its actual components: an armory of strings, hammers, dampers, white and black keys, organized to work simultaneously. Deprived of its primary function and mute, the instrument itself becomes a space for formal experimentation. The installation represents the atomization of the mechanism, the dissection of the instrument into many fractions: the connecting joints are pulled out, the soundboard dislocated, sanded off and polished. Each piece becomes independent from one another, rearranged horizontally in a silent congregation, and a new order. 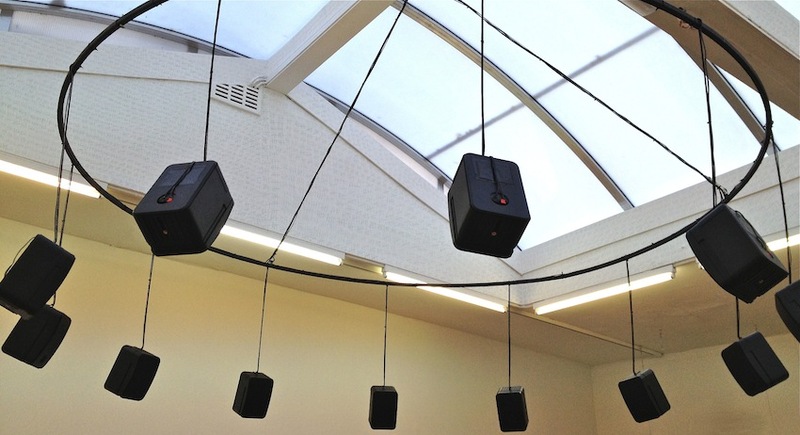 Arsenal is part of a group show entitled From Sound To Silence that includes the work of 15 international artists. The show aims to create a journey that stimulates our interpretation of sound through drawings, paintings, photographs, sculptures and installations. Portrait Of A Great Aunt, Constantinople. 1892 is part of the IMAGO MUNDI - MEDITERRANEAN ROUTES exhibition that opened in Palermo in February 2017. The work is printed on linen on a 10 cm x 12 cm canvas, based on a family picture. The Lebanese collection is curated by the Beirut Art Residency. Perpetuum Mobile is a composition for a 12 channel sound installation. 12 loudspeakers stand in a circle. One note moves from one speaker to the next, every second, clockwise. This seemingly organized sonic unfolding, gradually turns chaotic as the composition falls into rhythmic disorder and disorientation, before returning to the one note order. Perpetuum Mobile recreates the impression of a realtime echo within a controlled environment; a travelling sound that loses the consistency of its original source, and transforms over space and time. By focusing on this phenomenon, the installation examines endeavors of measuring time and contrasts the rigid order in such systems by counterpointing them with the disorder and unpredictability of experience. The apparent structure represented by time measuring devices is falsified and challenged by introducing the affects of the very chaos they attempt to organize and codify. Perpetuum Mobile was first exhibited at the Stedelijk Museum Bureau in Amsterdam in 2014, then at the AUB gallery in 2015. It is on display again, sponsored by the Baalbeck International Festival, in a totally new setting where speakers are perched on 3.25m high metallic stands. The impeccable acoustics of the magnificent Temple of Bacchus in Baalbeck inspired a revision of the sound and music that differ from the original composition created in 2014. The sound installation is part of a group show entitled The Silent Echo, curated by Karina El Helou, that includes works by Ai Weiwei, Ziad Antar, Laurent Grasso, Marwan Rechmaoui, Susan Hiller, Paola Yacoub, Danica Dakic and Theo Mercier. Perpetuum Mobile was part of a group exhibition titled "This Is The Time, And This Is The Record Of The Time". The curators, Nat Muller and Angela Harutyunyan have taken their cue from Laurie Anderson’s ominous 1982 song “From the Air” where she describes the duration between becoming conscious that the plane will crash and its actual impact. The show proposes to critically question our relationship to time, as well as our relationship to the mechanisms of recording time, particularly in moments of crisis or other transformative contexts. The audience is invited to experience the fluid passing of time and its chaotic transmutations through the mediums of sound and music. 12 channel sound installation with silent video, Project Biennial of Contemporary Art in Konjic, Bosnia-Herzegovina. A Bunker Fairy Tale was exhibited at the Project Biennial of Contemporary Art in Konjic, Bosnia-Herzegovina. The Biennial takes place in Facility D-0 ARK Underground, inside Tito’s atomic bunker that was held secret until the 1990's, now turned into a contemporary art museum. This work is originally a 12 channel sound installation with a silent film projected on a wall inside the radio communication room of the bunker. In this audible version, the 12 channels have been edited into stereo tracks. A: Excuse me, I was just wondering if you could help me find my way. P: Well that depends on where you want to go. You can start with one step back, then another step back, then all the way back to yesterday. A: But I can’t go back to yesterday, I was a different person then! P: So you're completely lost. Where do you want to get to? P: Then it really doesn't matter which way you go. A Bunker Fairy Tale is the story of an imagined encounter, inspired by James M. Barrie’s Peter Pan and Lewis Caroll’s Alice in Wonderland. It explores the concept of memory in a space that has not been affected by the passage of time, the ephemeral stage of childhood, regarded as a separate time and place, and the act of remembering as a way to reinvent the past. The project started with the idea of storing memories in a "safe" place inside a bunker. The images are comprised of footage from my family archive of a birthday party in 1975, the year in which the Lebanese civil war started. Friends and family members who appear in the silent projection on the wall of the bunker have either passed away, or left the country. The concept regards the home video (in this case, the Super 8mm film) as an object that belongs to a particular time and space, distancing itself more and more from the present with each passing day. The main protagonist in the film is the moment itself, a quiet and untroubled time unconscious of what's coming next: the war on the one hand, and adulthood on the other. Childhood is often portrayed as a safe refuge, a protected haven freed from future pressures and ordeals. Perhaps what it has in common with the medium of sound is that both can be intense but fleeting experiences that we lose as we grasp their significance. All that remains consist of visual traces of a memory that resemble the fiction and the power of fairy tales. 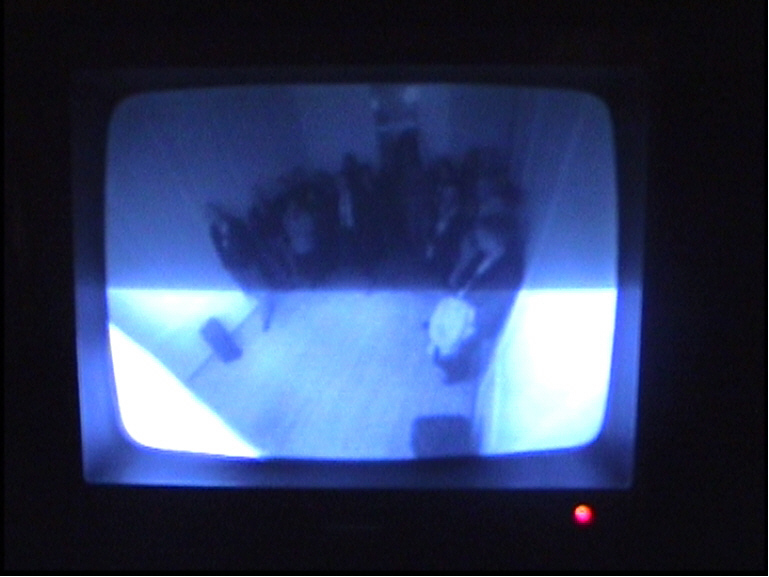 Installation view - Video projected on the wall and 12 speakers spread on both sides of the corridor among 1960's radio communication devices. 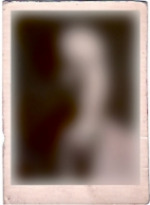 "Missing Links" is part of a broader work that attempts to reconcile the notion of inherited memory with that of unfettered fantasy; or, how to tackle a singular family history when, over the years, different stories have been told. 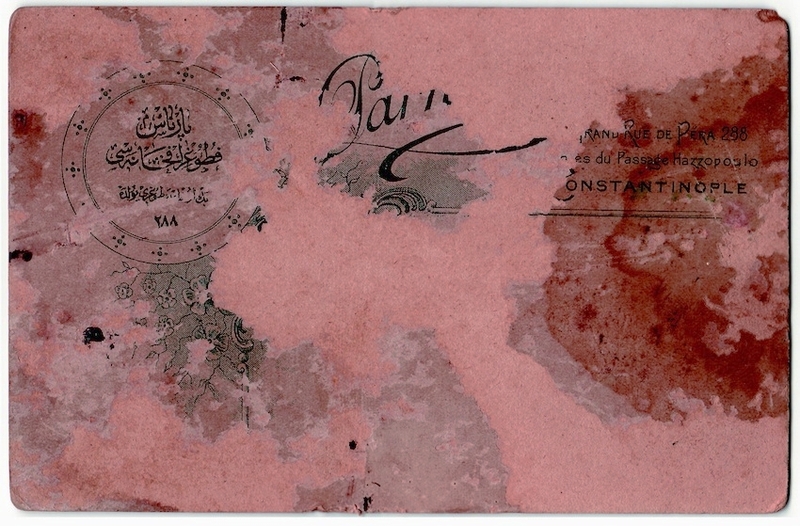 I went looking for traces in Istanbul, from archive registers to physical locations; investigating a man who was my grandfather in a city that was not mine. All I knew of him were romanticized notions: He was born somewhere around 1893, he lived in a palace, his mother was a pianist, his family was wealthy. And all I knew for sure remained the fact that he was a painter who, unlike my other ancestors and the Armenians of the diaspora, had deliberately chosen to emigrate from Constantinople to Beirut in the beginning of the twentieth century. The only records of reality that I had in my possession were old family photographs, bolstered by the stories my grandmother told my mother, who in turn told me. 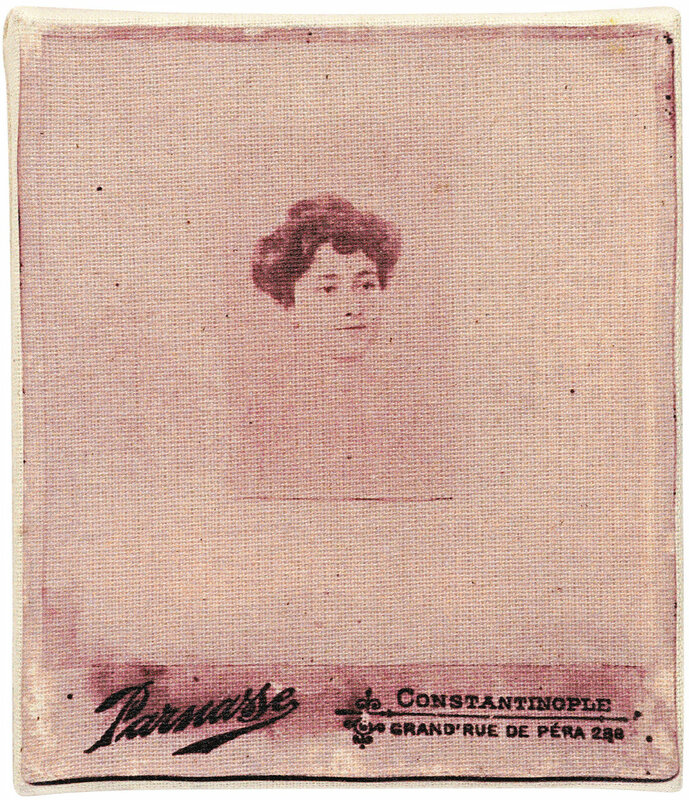 On the reverse side of these pictures were numbers and street names, though most often they turned out to be the addresses of photographers rather than the subjects who sat for them. The absence of material slowly contributed to making my grandfather "material" himself. In an attempt to bring focus to a man who seemed to reside only in the blurs of my genealogy, I walked those streets, re-inventing him, re-creating episodes of his life and re-writing his story while taking inspiration from history and my own family's tales; as if by slowly moving away from "reality", tracking down evidence became almost unnecessary. The installation consists of 15 sheets of paper that frame an illustrated account of my grandfather, A. Manass. The papers rest on top of a black wooden box (length 2.30 x width 80 cm - height 90 cm) under which eight 40 W speakers are placed, facing up. 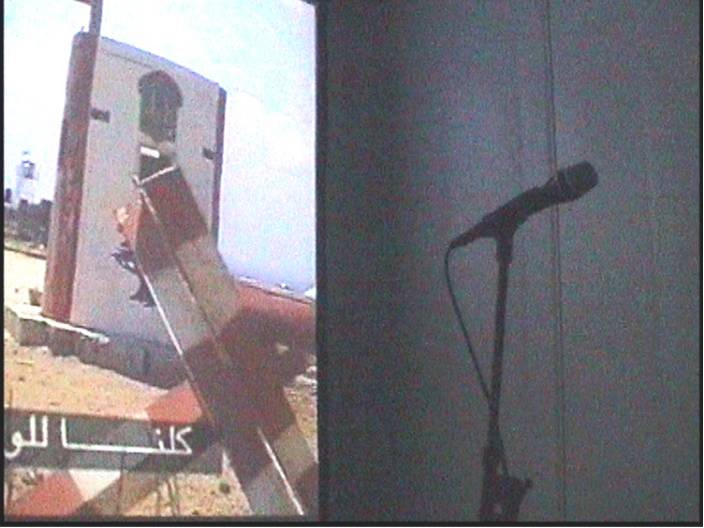 Installation view, Beirut Art Center: the 8 channels are spread over 16 speakers embedded in the low ceiling of a confined space. The sound is spatialized and the visitor would enter as if stepping inside a sound box. We used to play music in shelters. Get vinyls from abroad whenever we got the chance. If found in local stores, M. would break those same records so we'd have the exclusivity to own them... This was Beirut, in 1985. If the whole country was going to hell, our music was not going along with it. It was our life, our time. We were 15, 17 and 18. All I have from those memories, and others that are much older, are tapes that I found in a box, stored in the attic. Some memories are as old as me. I hear myself talk, I am a stranger's voice that seems to have belonged to me, but got lost somewhere in time. Somewhere in this Pandora sound box that I decided to organize one day. For the City Of Women festival in Ljubljana, I opted for more intimacy. Since this was a ‘diary,' it would be confided as such through a more confidential and personal interface which is a headset - as a bracketing of a certain moment in time. Here, each listener is able to travel individually between disparate reminiscences of the past, encountering the remains of a long lost world. Overwhelmed by Hong Kong's construction sites cacophony, I muted a single room with polystyrene walls and camouflage fabric inside a building that was pulled down at the end of the exhibition. The installation was produced as part of an international artists two-week workshop that was an attempt to confine a wide range of artistic directions within the boundaries of a specific physical context. The workshop took place in a small private corner of the town of Aley overlooking Beirut, holding dormant the obscene memories of a not so long ago war. Destroyed family houses dot the landscape mixing with the new and the renovated. 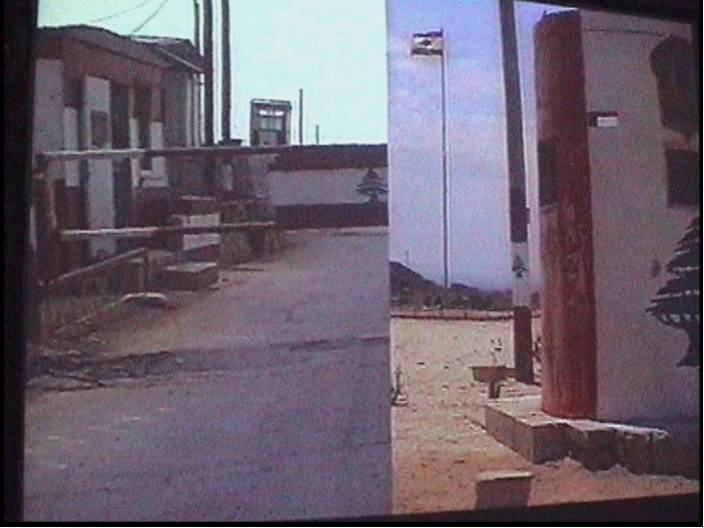 Aley was partially bombed during the war and many of the spaces within the immediate context of the workshop had not been restored since, making them inspiring grounds for artistic experimentation and production. At first, I thought it would be difficult to disconnect from Beirut, my home and studio only 30 minutes away. But the location and the atmosphere were just perfect. The ruins themselves were powerfully overloaded with history; I felt the urge to work outdoors, more like a virtual farmer. The fields, once used as a natural space of nurture and growth were turned into a magnetic zone with the light, plugging the visitor into another dimension.